PORTLAND, Maine — Police have charged a local man with a hate crime after he made derogatory comments about the sexuality of workers at downtown deli. 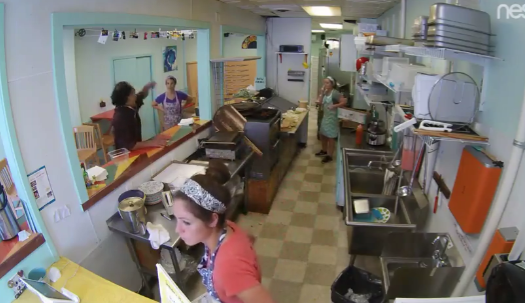 On Tuesday, the sandwich shop posted a security camera video of the incident on its Facebook page. The video appears to show Taylor shouting profanities at three female employees and taunting them to call the police. “You think you are better workers than the hard working man, huh, you lesbian dykes?” Taylor can be heard yelling in the video. In the post, Sisters blamed the city for doing too little help the people with mental illness and drug addictions who frequent Monument Square. Taylor was charged with disorderly conduct, interference with constitutional rights and criminal mischief. He pleaded guilty to the disorderly conduct charge Monday and was sentenced to serve five days in jail, according to the statement. The case has been referred to the Civil Rights Division of the Maine attorney general’s office and Taylor has also been ordered to stay out of the deli. “Like all cities, Portland at times struggles with the impact of untreated mental illness throughout our society,” the city stated.